IN THE 10 YEAR REUNION EDITION OF THE REBEL DISPATCH 1987 MY COMMENTS:" I HOPE TO SOMEDAY BECOME A NAUI DIVING INSTRUCTOR AND START A BUSINESS OF MY OWN." MY GOALS ARE COMPLETE. I AM NOW A PADI MASTER SCUBA DIVER TRAINER INSTRUCTOR. I HAVE A POOL CLEANING SERVICE. NOW IN MY SPARE TIME I WORK AS A RESERVES POLICE OFFICER WITH WEST MONROE POLICE DEPARTMENT. GOD HAS BLESSED MY LIFE! 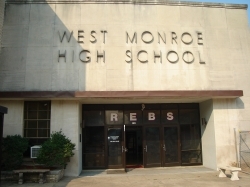 GO WEST MONROE!!!!!!!! Retired USAF Veteran, Desert Storm/Shield Member. After missing all the class reunions due to military deployments, I'll be at the 2007 reunion. Currently getting the last kid through driving school! (LoL) I'm looking foward to seeing all of my friends there next May 2007, I still have my lettermans jacket, though a lil small now.